However, these genetic solutions are great for usurping funding - which seems to be the primary motivation under the pretense of health research. I will soon be posting Dr. Foster's paper which clearly shows how wasteful and ludicrous modern drug based medicine is, when in the main most health issues can simply and cheaply can be determined via demographic studies and then resolved by mitigating nutritional deficiencies based on environmental considerations and cleanups. Inability to detox is just one subset of inadequate nutrition..
Don't know if you get this e-newsletter, but wanted to be sure you saw this article, which points to reduced glutathione levels in children with autism. Glutatione is the amino acid Foster fingers in the AIDS epidemic. They did a small study showing that nutrition did restore glutathione status in the autistic children. Not just restored it, made it better than in "healthy" children! These children "benefited markedly". Doesn't say how. The article also doesn't say what nutritional intervention was used. But what great beginnings! Wish they wouldn't call it an "inherited weakness" until they try supplementation with glutathione regeneration nutrients (vitamin C and selenium, along with the needed amino acids)! High levels of toxins deplete glutathione. These kids may have genetically compromised detoxification ability-or they may just have been poisoned! More canaries! Mercury-Autism Risk Increased By Newly Discovered "Biomarker"
A recent study by the Environmental Working Group suggests that some children may have an inherited weakness which predisposes them to developing autism when exposed to mercury and other toxic chemicals. The new research shows that some children lack sufficient levels of glutathione, an amino acid involved in several cell processes, to metabolize the toxins. "When compared to normal, healthy children, autistic children showed a significant impairment in every one of five measurements of the body's ability to maintain a healthy glutathione defense," the Environmental Working Group said in its report. "Reduced antioxidant defense may characterize a group of individuals who are demonstrably more sensitive to the effects of a range of toxic chemical exposures, and shed light on increasing rates of related learning and behavioral disorders." This newly published research and follow-up testing by former FDA senior research scientist Dr. Jill James, now of the University of Arkansas for Medical Sciences, has uncovered a unique and consistent metabolic imbalance in autistic children when compared to normal healthy children (James 2004a, 2004b). 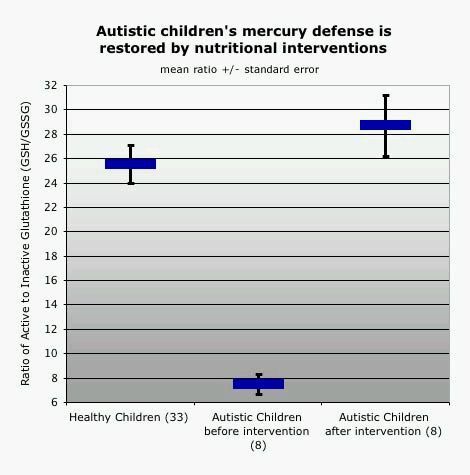 The findings by James significantly strengthen the science supporting a connection between mercury and autism, contrary to the recommendation of the Institute of Medicine, that research on the relationship between mercury and autism be abandoned. "The implications of these findings extend well beyond thimerosal and autism," the report reads. Autism includes a range of symptoms including an inability to socialize normally, often repetitive behavior, and sometimes speech difficulties. Autism rates have increased recently in the developed world by many different measures. There is no known cause or cure. Executive Summary of this study is here. Hi Chris, i hope you had nice holidays. i read your recent article about Autism & mercury. the last article you gave me for Dr. Megson which i have been trying to contact her but no respons. so the article ubove mentions Dr. Foster. when i click onthe link for information about him, it is does not mention that he is treating Autism. anyways my question is the method mentioned to restore mercury defence through nutrition, who can i contact for that? There is a natural product that contains the building blocks for the cells to produce Glutatione. That product is produced by Immunotec Research Ltd in Canada. You can get more information at www.immunotec.com/glen or send me an email. Happy to read all this good information. I am setting up my own website in The Netherlands (europe) to inform patients with MS (like me) who want to get out of the wheelchair and start to detox and walk again...Thanks for the valuable information. My five years old son has autism.I need help.Please contact me by e-mail or telphone 760-940-2146.Thanks..